Mystery & Imagination Bookshop weaves together three events on Sunday, August 26 from 1:00-4:00 p.m. 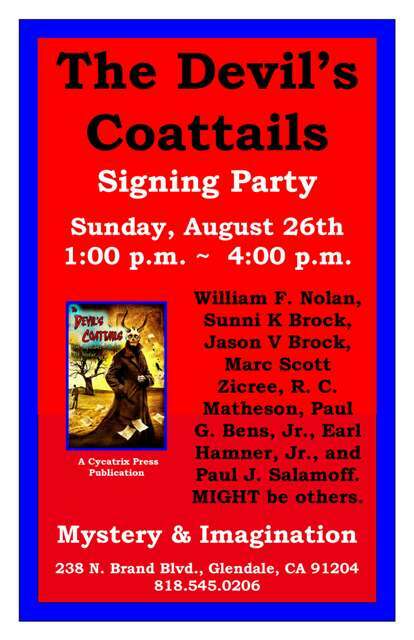 The Devil’s Coattails signing party brings together the story collection’s editors, authors and publishers — William F. Nolan, Sunni K Brock, Jason V Brock, Marc Scott Zicree, R. C. Matheson, Paul G. Bens, Jr., Earl Hamner, Jr., and Paul J. Salamoff. 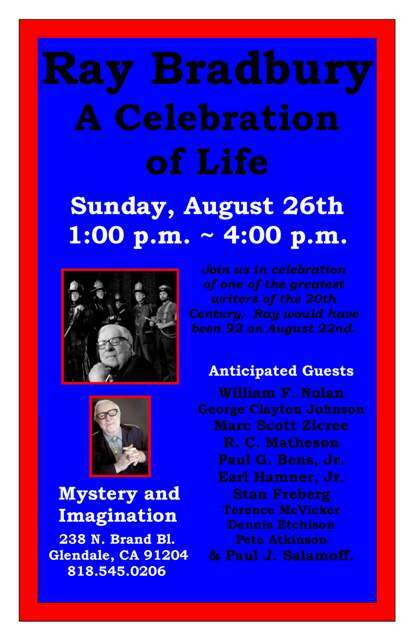 At the same time some of those same folks, plus others, will participate in “Ray Bradbury: A Celebration of Life” — William F. Nolan, George Clayton Johnson, Marc Scott Zicree, R. C. Matheson, Paul G. Bens, Jr., Earl Hamner, Jr., Stan Freberg, Terence McVicker, Dennis Etchison, Pete Atkinson, and Paul J. Salamoff. 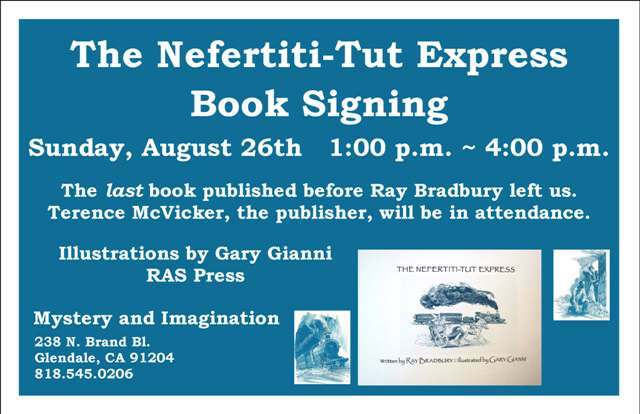 And there will be a simultaneous signing party for The Nefertiti-Tut Express, the last book of Bradbury’s to appear before he left us. Publisher Terence McVicker, the publisher, will be in attendance. The book features illustrations by Gary Gianni. Mystery & Imagination is located at 238 N. Brand Bl., Glendale, CA 91204. This entry was posted in Like Show Business and tagged Dennis Etchison, Earl Hamner Jr., George Clayton Johnson, Jason Brock, Marc Scott Zicree, Mystery & Imagination Bookshop, Paul G. Bens, Paul J. Salamoff, Ray Bradbury, Richard Christian Matheson, Stan Freberg, Sunni Brock, William F. Nolan by Mike Glyer. Bookmark the permalink. 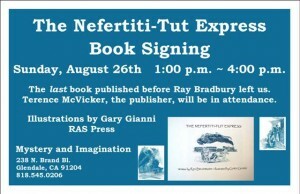 Plus there will be an raffle of Ray Bradbary related items.